By the time Friday rolls around, most of us are ready for the slower pace of the weekend. And if you’re like me, no matter how much I’m craving the comfort of pasta, I shy away from recipes with the word “Bolognese” in the title. I imagine mountains of chopped vegetables and hours of simmering. At least that’s what I used to think—until I came up with this recipe. Using a food processor instead of chopping the veggies makes prep-time for Walnut Bolognese a breeze. The best traditional sauce concepts combined with contemporary vegan cookery, this hearty meatless sauce can be served over pasta in just about 35 minutes, start to finish. The secret to getting a rich sauce more quickly is doing a really good job sautéing the walnut-veggie mixture, turning up the heat, decreasing the liquid. Browned foods taste good! 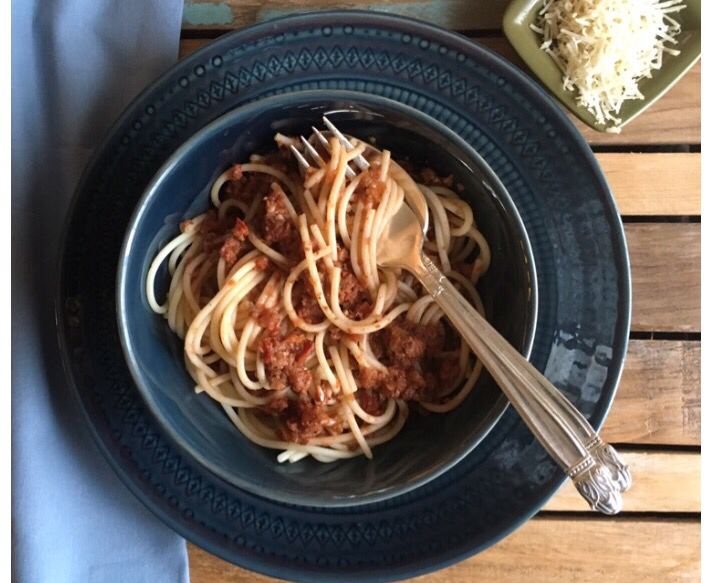 So what could be better than a quick and easy Bolognese sauce? A nutritious one. And this one is definitely that! Here is one satisfying Meatless Friday meal packed with veggies and full of healthy omegas (and antioxidants) found in nuts and mushrooms. Not to mention that my whole family loves it—even my grandsons! Long week – low-stress ending. Let’s make Bolognese! In a food processor, pulse walnuts and mushrooms together until coarse and set aside in a bowl or on a flexible cutting mat (the texture resembles ground beef, which gives a meat-sauce mouthfeel, and kids who don’t like mushrooms won’t even know they’re in the mix.). Pulse onions, carrots, celery, and garlic into a coarse paste. Puree diced canned tomatoes in food processor. Add the tomatoes, red wine, bouillon, and bay leaves to browned veggie mixture in pot. Cook on medium-high heat until boiling. Reduce to medium and let simmer hard for 10-15 minutes with tilted lid. Taste for seasoning (it will probably need more salt) and add as needed. You may need to a splash more water (or wine), add liquid if needed to prevent scorching, but remember you want a thick rich sauce. Stir and TASTE. About the author: Catherine Hamilton, a Catholic freelance writer, member of Catholic Writers Guild, and Benedictine Oblate, has articles in magazines and newspapers. Nine Days–Poems Remembering Pope John II (2015), is available on Amazon. In the year 2000, Hamilton meet Pope John Paul II in his private library while on pilgrimage. An Oregonian of Polish decent, she lives her husband of twenty-five years, and is blessed with five stepchildren and four grandsons. Visit her website at www.catherineahamilton.com and follow her on Twitter @CatherineAHamil.